Having started its operations in 1993, RDC Concrete (India) Pvt Ltd is now become the largest non-cement ready mix concrete company in India. Over the years, RDC Concrete has established a reputation for being able to deliver cost-effective and innovative building solutions to meet a variety of requirements. Among the first to recognize the constantly evolving nature of the industry, RDC Concrete has consistently invested in building and maintaining state-of-the-art R&D, manufacturing and quality control infrastructure. It is this focus on quality and innovation that has enabled RDC Concrete to build a client base that includes some of the most respected names from the Indian building and construction sector. 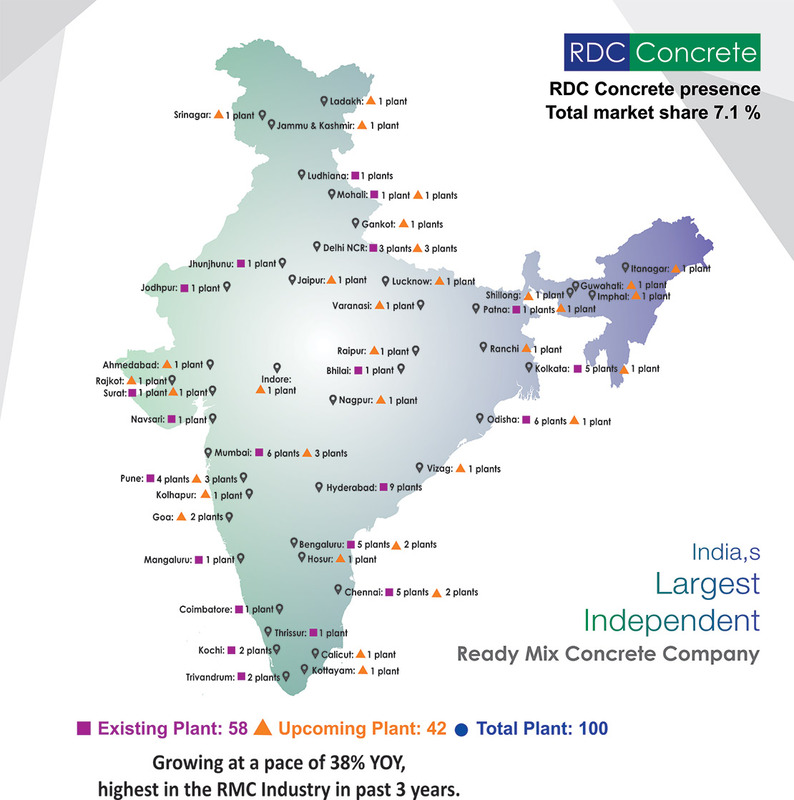 Having captured a significant share of the market in many parts of India, RDC Concrete is now spreading its network to other locations in India to serve the requirements of the rapidly growing Indian construction industry. The raw materials are subject to stringent quality and quantity measures. The concrete is subject to quality control throughout the manufacturing and delivery process. A wide variety of ready mixed concrete can be produced, with ease and on demand, by varying the proportions/combinations of the cement, aggregates and admixtures. the availability of a large number of concrete mixer trucks which enable delivery rates to be kept under control. supply of special services for difficult worksites like pumps, conveyors, etc. the ability to adapt the pace of deliveries to the customer's needs. Basic materials are now not stored on site and this reduces the need for storage space. Plant and machinery for mixing concrete are not required. Labor associated with production of concrete is reduced. Time required for the entire process is greatly reduced. The use of RMC reduces air pollution in and around the worksite as the mixing is done at the plant. Pumping is one of the most efficient means of pouring concrete. In many situations-such as in high rise buildings - pumping is the only viable option. At other times, the ease and speed of pumping concrete makes it the most economical method of pouring concrete.